We all know what happened to Alice after she followed The White Rabbit and tumbled into Wonderland, but what about the people she left behind? After Alice tells the story of Alice's sister, who is the first to find Alice having gone missing, and Alice's best friend Ada, who too disappears down the rabbit hole into the wondrous land where anything is possible. Concerned about her friend, Ada follows in Alice's footsteps and has an adventure in her own right along the way – making her a much stronger and confident girl than she was before she met the crazy cast of characters we know and love from the original tale. 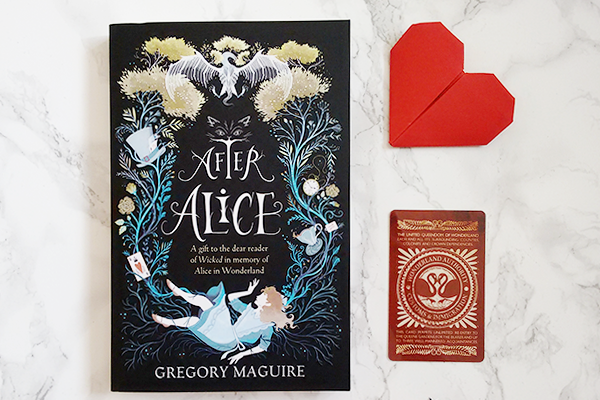 Gregory Maguire truly captured the whimsical characters and surroundings of Wonderland in his re-imagining of the famous story, and it was a delight to return to this place where anything is possible yet seeing it from the perspective of a new character; one who fitted perfectly in the original tale and had her own journey of growth and discovery along the way. Seeing the story we all know and love from a different angle, added a layer of depth to this imaginative world and shone the spotlight on some characters and elements perhaps not fully explored before. All the moments spent in Wonderland were a delight to read about, which is what made it a shame we were constantly pulled out of this world by switching back and forth between Ada's story and that of Alice's sister Lydia in Victorian Oxford who, together with Ada's governess Miss Armstrong, is searching for the two missing girls. The headstrong Lydia and waffling Miss Armstrong were extremely unlikeable characters and so in addition to not being part of the Wonderland tale, they were also just not very enjoyable to read about. This half of the book did get a spark of interest with the addition of Siam later on in the story, but this was fleeting and not really developed very well, so it felt like he was added in as an afterthought only. Writing-wise too, this felt very much a book of two halves. In many ways it's childish and captures the same style of storytelling as the original, but then there is the occasional burst of 'pretty writing' and using difficult language just for the sake of it, that pulls it away from a children's or young adult tale, straight into the adult genre. Gregory Maguire didn't quite know who his intended audience was for this novel, and that unfortunately shows. After Alice does what it says on the tin; it follows in the footsteps of Alice's tumble into the rabbit hole and explores the aftermath on those closest to the little girl. What it lacked in depth and intrigue for those who were left behind in Victorian Oxford, it more than made up for with the entirely new exploration of Wonderland through the eyes of Alice's best friend Ada. This is a character worthy of a Lewis Carroll novel, and she takes the spotlight with at least as much curiosity and courage as her famous friend. If you are already a lover of Wonderland then this addition to the literary classic will be right up your alley. And if not, at least have a cheeky visit to enjoy a mad tea party. After Alice is published by Headline and you can buy the novel from Foyles or your own preferred retailer.